The official re-issue after being unavailable for a while from their original label Mai Tai. These 2 Swiss geniuses capture perfectly the vibe of the most thrilling 60's spy soundtrack music. For Fans of: HENRY MANCINI, JOHN BARRY, Surf Music, Spy and Crime Jazz. The Fluid Soundbox, the second full-length album by Ernest Maeschi and Karen Diblitz a/k/a STEREOPHONIC SPACE SOUND UNLIMITED, is chock-full of 50s and 60s-inspired instrumentals, done with contemporary flair. Delving into the backgrounds and personal lives of the intensely private Maeschi and Diblitz was difficult, and to be honest, their lifestyles make them sound like international jet-setters. Karen Diblitz works for the European Formula One racing tour and travels the world while Ernest Maeschi seems to be unemployed but is able to purchase expensive musical instruments for his recording studio and travel the world at whim. A Swiss duo creating enticing instrumentals with an ultra-modern twist that draw from a variety of genres, including spy movie theme music, surf, lounge, and exotica. This is their 4th album. Switzerland's Ernest Maeschi and Karen Diblitz have made their mark on the instrumental/exotica/space age scene. Using guitars, organs, vibraphones, bongos, weird outer space sounds, drum loops, samples and tape effects, the duo are also very capable songwriters whos music could easily hold up to the best U.S. composers of movie and soundtrack music from the 1960s (Henry Mancini, Vic Mizzi, John Barry, etc). Their 5th release on Dionysus is a movie soundtrack about the life of international racecar driver Jo Siffert. TRACKLISTING: 01. Jo's Theme 02. Requiem Pour Un Grand Pilote 03. Bossa Jo 04. Highlife At Monza 05. A Racer's Heart 06. The Last Of The Late Brakers 07. On The Road To Sicily 08. Top Speed 09. 70/71 10. Grid Girls 68 11. Fear Theme 12. Young Siffert 13. Le Mans Nightdrive 14. Brands Hatch 6 A.m. The long awaited re-release on vinyl of their first album! A collection of original tunes that could have been themes for any number of 60's or 70's TV shows. Although it's not surf and it's not lounge this music has more incommon with a modern small-combo version of movie composers sucjh as John Barry and Henry Mancini. Stereophonic Space Sound Unlimited have returned with their sixth Dionysus album, "Spooky Sound Sessions", a collection of 14 brand new songs recorded entirely at the legendary Spooky Sound record store in Zurich, Switzerland. The elusive duo consisting of Ernest Maeschi and Karen Simpson have once more worked their magic and created a series of instrumentals which will take you onto a journey into the great unknown. 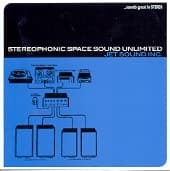 Guitars, organs, sitars, indian banjos, moogs, bongos and sounds of obscure electronic equipment exclusively available to the Spooky Sound lab have been woven into the unique sound experience that is Stereophonic Space Sound Unlimited.